The holidays’ are over and now is the time to start the New Year off right. After all the hustle and bustle of the holiday season it is the time to take care of our selves. Hopefully you have been sticking to some work out schedule and haven’t totally derailed your diet. But if you have, no problem, we will get you back on track. This year there are some very exciting and beneficial trends in food. Sprouted Grains- Grains and carbohydrates have a bad rap these days. Although not all carbohydrates are created equal there are some good ones out there. More recently you may have seen “sprouted” on bread or grain packages in the grocery store. Whole grains are the seeds of grass like plants that we harvest and process in to flours and other grains. Under the right conditions these grains will begin to sprout, meaning produce life. This process increases the availability of nutrients such as B vitamins, Vitamin C, folate, fiber and other essential amino acids including lysine. It is also thought that these grains are easily digested because the sprouting process has already begun breaking down the grain. Reduce sugar- Sugar has been a hot topic recently and how much is too much. It is estimated by the World Health Organization that the average person consumes up to 22 teaspoons of added sugar per day. That is equivalent to 88g of sugar. A typical yogurt can have upwards of 22-25g of sugar and 1 can of coke has around 40g of sugar. It is easy for this to add up quickly in our diet. Sugar, in any form, is a simple and quickly digested carbohydrate. It is found that limiting this and other refined carbohydrates is not only healthy for diabetics but can aid in cardiac function as well. Great ways to reduce sugar in your diet is to choose plain dairy and add fruit or other toppings, limit any sweetened beverage consumption or eliminate if possible, watch whole grain/whole wheat breads as sugar and honey are often added to improve flavor. Read nutrition labels and monitor the sugar amount in foods. Probiotics- these are not new and have been around for a while. Your digestive tract is how nutrients and other substances (good and bad) enter our bodies. It is important to keep it healthy and good bacteria present. L Avidophillus, L plantarum, L rhamnosus, and L reuteri are popular propbiotics found primarily in yogurts and other fermented dairy products. It will be common coming in the New Year to find probiotic-fortified foods. Also concentrate on fermented foods such as kombucha, kimchi, sauerkraut, and vinegars to keep the good bacteria healthy and gut function flowing. Betting on beets- that is right beets! They come in gold, purple and a rainbow of colors. Beets are high in betalanis, folate, fiber, manganese, potassium, copper, magnesium, antioxidants, anti-inflammatory properties as well as touted as containing chemopreventive activity. I love them in salads, with goat cheese or even pickled! Expect to see these pop up in different foods on your store shelves in hummus, spread, dips and juices. Pulses- Pulses are lentils, beans and chickpeas. These are a great source of protein and nutrients to help form a sustainable diet. Meat and other animal products are great sources of protein but can be taxing on the environment and high in saturated fat. Adding pulses to your meals to replaces animal proteins can add variety, nutrition, fiber, and are very affordable. You will see many more snack foods and side dishes made with these pulses. Not feeling very hungry?? Lentil salads are a great option for something light and very nutrient dense. 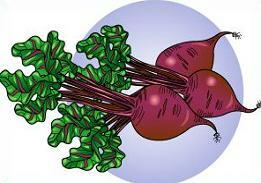 Cook the beets: Preheat the oven to 425 degrees. Wash and peel beats (may purchase already peel beets). Toss with olive oil and sprinkle with salt. Cook for 35 to 45 minutes, stirring with a spatula halfway through, until the beets are tender when pierced with a knife or fork. Remove from the oven and set aside. Cook the lentils: While the beets are cooking, prepare the lentils. Into a large saucepan, sauté onion in olive oil, add the garlic, stir for 1 minute, then add the rinsed and drained lentils and enough water to cover the lentils by about an inch. Cover and bring to a boil; reduce to a simmer, until tender but not mushy (about 30min). Drain any remaining liquid. Prepare the vinaigrette: Mince together the garlic, pinch of salt, and 2 tablespoons walnuts. In a bowl add the Dijon mustard and vinegar, and whisk until smooth. Drizzle in the olive oil, whisking all the while, until the full amount is incorporated. Season to taste with salt and freshly ground pepper. Combine ingredients in a bowl. Add dressing. Optional addition but tasty is to add some goat cheese or other soft, tangy cheese of your choices. Happy New Year and Happy eating.